Who invented the Pub Quiz? The British, of course! Here, for your pleasure, Britain's leading pub landlord, The Pub Landlord, presents a pub quiz master iPhone app of the highest quality. If you want a virtual Pub Quiz Master, then this is the app for you. It's jam-packed with over 100 exclusive soundbites from Al Murray, The Pub Landlord. Using this soundboard you can basically run your own pub quiz. It has a welcome, rules and regulations, right and wrong answers, cheats section, winners and losers sounds, plus sounds for handing out prizes, taking a mid-quiz break and other bits and bobs. Plus, you also have a mini Pub Quiz of your own on this app. Al Murray, The Pub Landlord asks you a bunch of questions himself and you need to choose from four answers. How many can you get? 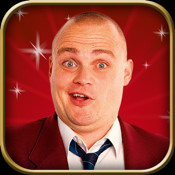 Then, once you've enjoyed the app, you can go and buy the shiny new book, Al Murray, The Pub Landlord's Great British Pub Quiz Book. Long title, great read.